Editor: It should be duly noted that Joey Chestnut, American has eclipsed Kobayashi as the champion of the world in many categories, especially hot dogs. While I give Kobayashi credit for making the sport famous, but there always is a bigger fish. Joey has decimated the other eaters. Once again, the 4th of July comes around and we have that time honored tradition of patriotism, no wait, fireworks, no wait…..YES, the Nathans hot dog eating championship at Coney Island. I told Steve O’Grady and Teressa Jiminez at RSDC that I’d be blogging this on the 4th of July, but I may not be blogging on a holiday, no one would read it, and how would you know not to miss this if I didn’t give any warning? He of course has other records including 67 hamburgers in 8 minutes, 83 vegetarian dumplings in 8 minutes, 100 steamed pork buns in 12 minutes, 69 krystal burgers in 8 minutes and 17.7 pounds of cow brains in 15 minutes. He does it by swallowing the dogs without chewing. He breaks the dog in half, eats it then dunks the bun in water and puts that down. Kobayashi will be up against other competitive eaters like Eric Badlands Booker ,Sonya “The Black Widow” Thomas who put down 37 dogs in her 105 pound frame last year and others who will try and lose to the Michael Jordan of eating. 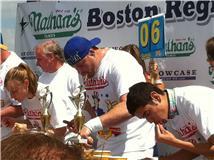 There is an outsider from America, Joey Chestnut who has downed 50 dogs in a qualifier. There is a point in which you can’t eat any more and that is like hitting the wall in the marathon. You just run out of space. Then there is the deadly “REVERSAL OF FORTUNE” in which the contents of your stomach come back to life. When I mentioned this to Steve and Teressa, they both agreed that the word reversal will never be the same and the visual will be with them for the rest of their life. So, it will be broadcast on ESPN at 12:00 PM on July 4th, don’t miss it. It only lasts 12 minutes, but eating will never be the same for you.